At the heart of every NANSENSE system lies a hub, which is powered by a quad-core minicomputer. The hub can connect up to 75 sensors across its six high-speed transfer buses. The hub has a built-in data logger that can store hundreds of recording on its built-in flash storage or thousands of recordings on its 64gb SD-card. Additionally, the hub has a variety of unique features including stand-by mode, which preserves battery life and calibration pre-sets without switching off the system. NANSENSE’s fifth generation sensors are smaller and more powerful than ever. With an internal update rate of 1000Hz, the tri-axial gyroscope, magnetometer and accelerometer compensate drift and calculate the orientation of each limb with a resolution of one degree of accuracy in each axis. All systems can be configured to run at either 60fps, 90fps, 120fps. 240fps is available for a limited number of model with fewer sensors. NANSENSE sensors are optimized for ultra-low power consumptions. Depending on configuration, systems ship with either 13000mAh or 20000mAh 5V batteries to ensure a full day’s capture on a single charge, equating to more than eight hours battery life. External latency is less than 20 milliseconds depending on connectivity method. Internal latency is less than 6 milliseconds, ensuring that each frame of data is outputted by the system in real time. The systems connect to the computer generally through WiFi but also through Bluetooth, USB or Ethernet. PCs can also be configured as WiFi hotspot for router-less capture, which is often very convenient for on-site motion capture. The suits come in five configurations, which differ primarily in the amount of sensors found in each glove. Custom configurations are available on request. NANSENSE Studio lies at the forefront of the NANSENSE software platform and is designed to simplify the user experience of connecting to a system, calibrating the system, adjusting kinematics and recording motion capture data in a variety of formats. NANSENSE Studio can be used to broadcast motion capture data to a variety of popular game engines and software packages across a network or locally. The SDK provides advance users the ability to expand the functionality of our systems and to tailor that functionality to their specific needs. The SDK is entirely standalone and can be embedded into any third-party application. We strongly encourage and support third-party developers. 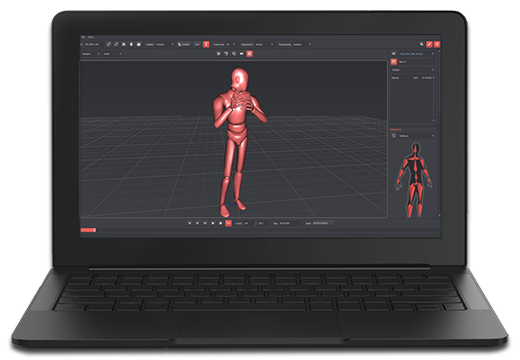 Whether it is for real-time motion capture, post-processing, animation retargetting or data cleaning, NANSENSE offers a variety of tools and plug-ins developed specifically for game engines and popular software packages.